Was Sunday a beautiful day for Wedding Photography? Well, I wouldn’t mention it if it wasn’t! Kim & Marcus’s Wedding Images turned out spectacularly. I’ll be posting some of my favorite Wedding photos here once I enhance them. What’s enhancement? I’m glad you asked. When an image comes out of the camera, it is rarely the best that it can be. On the image viewing site all the Wedding Photos are in what I call the Digital Negative state. While not technically accurate, it gets the point across that some manipulation should be done. That’s what I’ll be showing you on this posting. Usually I do what I call the 3 C’s. Adjustment of Crop, Color and Contrast. It makes a huge difference in the wedding photos and especially the prints. All of the images we print are adjusted when we receive the order then sent to the lab. 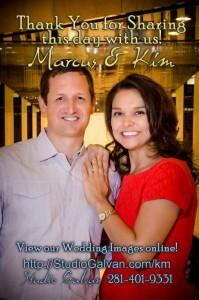 To view all the best images from Kim & Marcus’s Wedding and to order enhanced prints, please visit the Online Viewing & Ordering Site. Enjoy them and then leave a comment below!